The Dow Jones Industrial Average received a boost from banking stocks on Thursday after U.S. Federal Reserve Chair Janet Yellen said the central bank was on track to raise interest rates soon. During testimony before Congress, Yellen said the central bank was adjusting its economic outlook as President-elect Donald Trump prepares to take office. According to CME Group's FedWatch Tool, the probability of a rate hike now sits well north of 90%. The Dow Jones added 35 points on Thursday thanks to a strong surge in financial stocks. Shares of Wells Fargo & Co. (NYSE: WFC) and Bank of America Corp. (NYSE: BAC) both gained roughly 2% after Yellen hinted that the central bank will likely raise rates in the near future. The markets also benefited from positive economic data and signs that U.S. labor markets are tightening. Last week, the number of Americans seeking unemployment benefits fell to a 43-year low. With a lot of positive sentiment driving the markets higher, investors need to be aware of the best stocks to buy now. These companies will help investors capture growth and income no matter what happens during the Trump presidency. Here are the best stocks to buy now. The price of crude oil slipped in the afternoon despite increased optimism that OPEC members will formalize a deal to cap global production. This morning, Saudi Energy Minister Khalid al-Falih expressed optimism that the global oil cartel will continue to make progress ahead of its Nov. 30 meeting in Vienna, Austria. Despite the energy minister's statement, traders were still digesting yesterday's crude inventory report from the Energy Information Administration. The EIA reported that domestic crude stocks increased last week by 5.3 million barrels, well above analyst expectations. The WTI crude oil price today dipped 1.2%, while the Brent crude oil price dipped 1.1%. 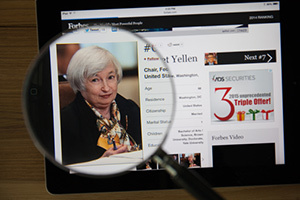 But the big news today was the testimony of Federal Reserve Chair Janet Yellen. During testimony on Thursday, Yellen said that she has no plans to step down when Donald Trump becomes POTUS and will finish her term as the central bank's chairperson through 2018. Even if Trump decides to remove her from the top position at the Federal Reserve, Yellen still can serve as a governor until the end of her 14-year term, which concludes in 2024. During her testimony, Yellen stressed the importance of a central bank's political independence to global markets. But the most interesting part of the testimony came when Yellen spoke about business investment in the United States. When pressed to explain why business investment remains low, Yellen said she was not sure, but argued that it was not due to the central bank's cheap-money policies. Shares of Valeant Pharmaceuticals International Inc. (NYSE: VRX) added 0.3% despite news that a former senior company director and the former CEO of Philidor Rx Services have been charged in a massive fraud scheme that included a $10 million kickback. The entire story is a massive headache for hedge fund manager Bill Ackman, who has watched his position in VRX stock fall more than 90% over the last year. The investigation could unearth more issues for the company, which is why Money Morning Global Credit Strategist Michael Lewitt has warned investors to steer clear of the company. Even though some top managers argue that the stock presents some value, the firm's balance sheet suggests that it could go bankrupt in the future. Speaking of Bill Ackman, the hedge fund manager has been leading a one-man crusade against marketing giant Herbalife Ltd. (NYSE: HLF). Ackman has accused the company of operating a pyramid scheme, a violation of U.S. law. Under new FTC guidelines, Herbalife's future is uncertain. Money Morning breaks down the latest news on HLF stock and explains what the company must do to comply with new laws. In earnings news, Wal-Mart Stores Inc. (NYSE: WMT) fell more than 3% after the company fell short of Wall Street earnings expectations before the bell. The firm would have likely topped earnings estimates, but falling food prices impacted its bottom line. The company reported earnings per share (EPS) of $0.98 on top of $118.18 billion in revenue. Wall Street expected $0.97 on top of $118.52 billion in revenue. After the bell, look for additional earnings reports from Salesforce.com Inc. (NYSE: CRM), Gap Inc. (NYSE: GPS), Intuit Inc. (Nasdaq: INTU), Marvell Technology Group Ltd. (Nasdaq: MRVL), and Ross Stores Inc. (Nasdaq: ROST). Louis Federal Reserve Bank President James Bullard speaks at 5:30 a.m.
Kansas City Federal Reserve Bank President Esther George speaks at 9:30 a.m.
William Dudley speaks at 9:35 a.m.
Dallas Federal Reserve Bank President Robert Kaplan speaks at 1:30 p.m.
Federal Reserve Board Governor Jerome Powell speaks at 9:45 p.m.